OBA Canvas Co. is a family owned and operated marine canvas and upholstery shop on the beautiful Alabama Gulf Coast. We are proud to feature a wide variety of Sunbrella indoor and outdoor fabrics. Since boating, swimming, and relaxing on the beach is our way of life, we've come to specialize in the custom design and fabrication of Sunbrella canvas accessories that can stand up to intense sun exposure and active lifestyles. Our canvas accessories not only will withstand the elements, but also happen to be sophisticated and stylish! Our Sunbrella canvas accessories include, but are not limited to, Sunbrella indoor outdoor pillows, Sunbrella boat mats, and Sunbrella boarding mats. We're all about living the comfortable life. From indoor outdoor Sunbrella pillows to custom Sunbrella boating accessories, our Sunbrella canvas products will transform your outdoor space into a true extension of your home. Enjoy the comfort and luxury of a well-accessorized patio, deck, boat, porch or yard. With our high quality outdoor fabric by Sunbrella, we're able to offer you the best of both worlds - beauty and durability. We invite you to browse our inventory. And, feel free to customize your order with the Sunbrella colors and patterns you love. 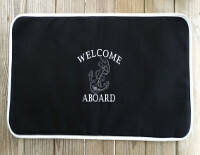 Our custom embroidered boarding mats will give your sandy sole a place to land while boarding your boat. Personalize your boarding mat to fit your boating lifestyle. Our mat for the sandy sole is a perfect addition to your boat or dock! Whether you personalize with your boat name or welcome your guests aboard, you are sure to impress with our handcrafted Sunbrella mat! 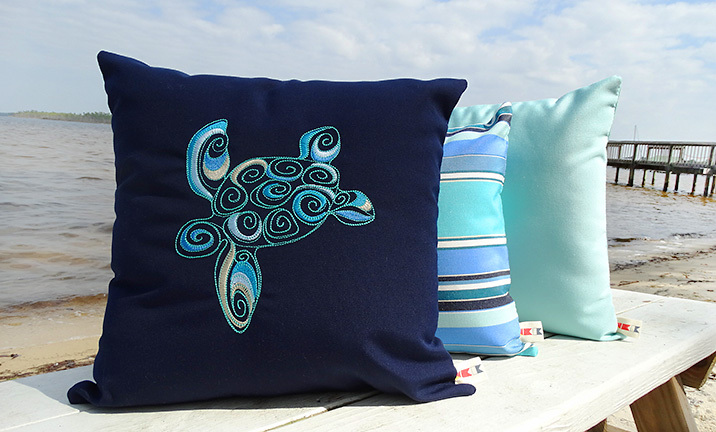 Let our embroidered pillows be the finishing touch to your artfully designed indoor or outdoor space! Monogramming and color customization are available. 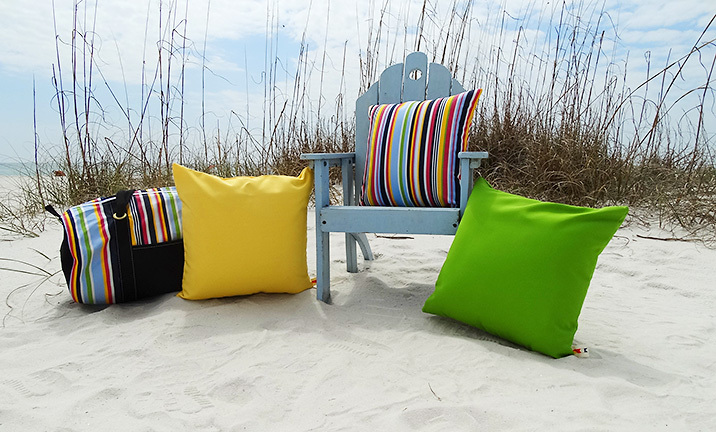 Take outdoor comfort to the next level with our incredibly durable Sunbrella® pillows. Mix and match the pillows from our Sun Shop to brighten and personalize any space.